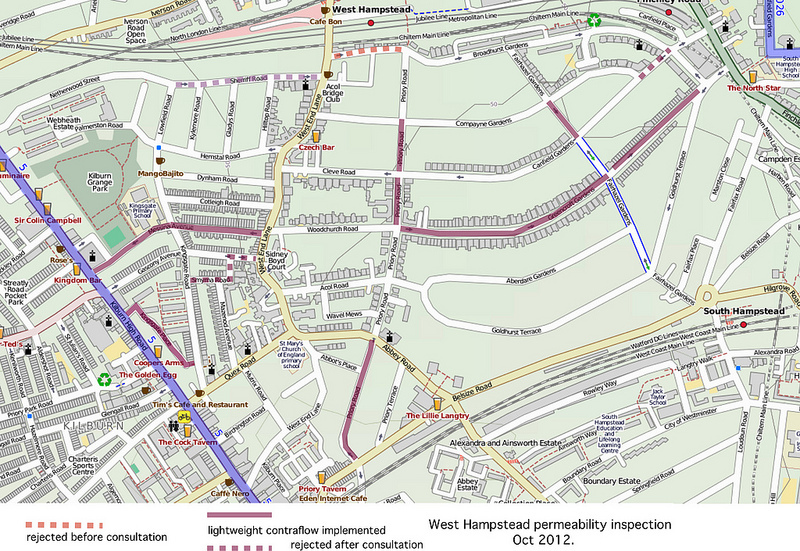 A little over a year ago proposals came forward to allow more contraflow cycling in South Hampstead. Some people thought this was madness, but it went ahead anyway. One thing that seemed clear was that for it to work safely, the signage both in terms of road signs and on-road markings, would have to be exemplary. 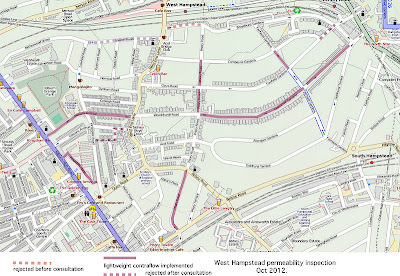 With this in mind, Camden Cyclists, a lobby group, set out to explore the streets in immense detail and document their findings in order to suggest improvements. Their full report is incredibly detailed but as with so many things, this is where its value lies. I hope Camden reads it carefully as some of the recommendations could help prevent road accidents and they are by and large easy to implement. 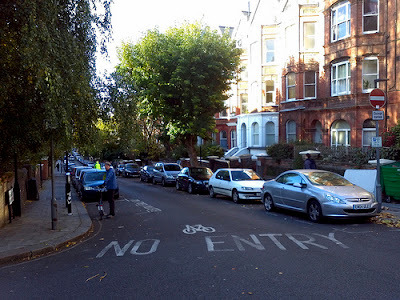 Perhaps a quick recap of where cyclists can now cycle on one-way streets would be helpful. Priory Road and Fairhazel Gardens are now both two-way cycling throughout. Fairhazel Gardens is now fully two-directional for cyclists (some sections were changed a few years ago). Greencroft Gardens has been made two-way for cyclists as has Messina Avenue, which gives a link through to Kilburn High Road. “The contraflow facility is useful, but does require some confidence to use. is hidden in a tree; the sign on the right is unhelpfully placed. An entry lane should be marked and the little cycle logo could be bigger! 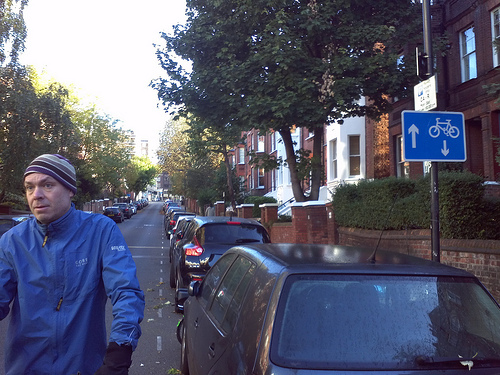 Camden Cyclists are still pushing for some additions to the contraflow system. Compayne Gardens, which is two-way, is preferred by cyclists and is marked with cycle logos. But it fails as an eastbound route because it joins the one way Canfield Gardens before reaching the junction with Finchley Road. 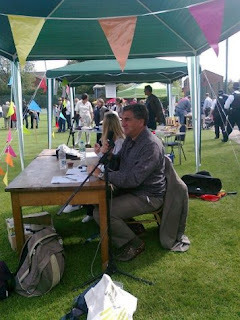 We very much regret that LB Camden has so far been unable to provide this link. Camden Cyclists’ overall conclusion is that the scheme generally works well: “For the most part, the signage at the end of the roads is of a high standard.” The group does, of course, have some suggestions for improving legibility, especially so drivers are aware of the scheme. You can see all of the recommendations on its website. NDP: Tall buildings and affordable business premises What have I missed since November 26th?